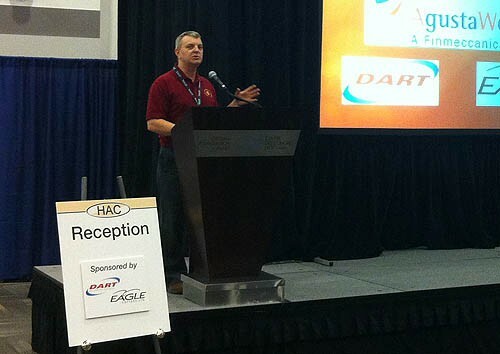 CFFF President Robert Kirkpatrick addresses delegates and exhibitors at the Helicopter Association of Canada conference in Ottawa Mar 16-18, 2012 following the awarding of the silent auction items. Half the proceeds of the auction were donated to the Foundation in support of the Lone Pine Tree fund. The lone pine tree is the focal point of the soon to be unveiled Canadian Firefighters Memorial. The Conference was attended by CFFF President Robert Kirkpatrick and CFFF Director & Wildland Representative Paul Buxton-Carr. 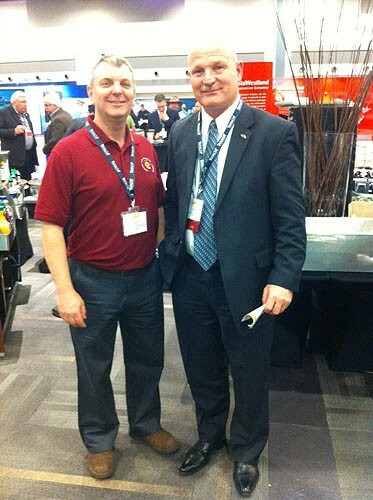 CFFF President Robert Kirkpatrick with Helicopter Association of Canada President & CEO Fred Jones.